In the last five years or so, easing up only last year, there has been an affluence of dystopians in the market. Divergent, Under the Never Sky, Hunger Games, etc, all of them were at their peek and flourishing. Everywhere you looked, the YA shelves were filled with highly recommended dystopian novels. The hype was off the roof, and naturally I bought some of those novels. And then, after reading maybe five of them, I stopped. Most of my currently unread hard copy novels are in fact dystopians. Divergent, Under the Never Sky, Defiance, Partials, Red Hill, Delirium, Breathe, World After... the list goes on. All should be great books, and yet something stops me from actually picking them up. They're left unread and untouched, passed over in favor of romantic tales and fantastical worlds, some of which came long after them into my possession. Then, after reading Wither back in 2013--and when I say "read" I mean force myself to pick up a dystopian novel, any dystopian novel, because I haven't read one in weeks and they're pilling goddammit!--I suddenly realized why. For the most part, I... simply don't like reading dystopians. I don't believe in forcing one's self to read a genre just because it's popular and everyone loves it, when you're not really enjoying the experience of reading it. I'd like to clarify that I have read great dystopians and in all honesty most of the books I've read in the genre were fantastic. I just didn't enjoy reading them. Out of the books I've read, only two or three are five stars, and none of them made it to my favorites shelves (aside for the Knife of Never Letting Go). I'm not going to read any of them a second time. I'm not going to force my cousin, Yuval, to read any (the sure sign that I really love a novel) - I have, in fact, never done so with a dystopian. Ever. The reason for this aversion? DYSTOPIANS ARE DEPRESSING. I am a person prone to depressions. I combat them on a daily life level, some days literally forcing myself to get out of bed and face the world. I had three instances in my life that I couldn't do that, and spent the majority of three or two weeks in bed, doing absolutely nothing. It was very hard to pick myself up again after that. And I am not considered a bad case of this disease (have never went to diagnose it, either, because that would make it far too real, and when I'm okay enough to care about diagnosis I'm also lucid enough to feel completely ashamed of that weakness, but that's a separate issue). Dystopians are so hard for me to read. The very depressing, disturbing and cruel realities these people live in make me physically feel heavier. I feel myself drowning under the weight of realities that don't even exist (yet). In my mind, they're associated with depression, worse-case scenarios and impossible choices. With no way out, death and loss. To put simply - they scare me. They scare me because I read to feel better, to shake off the things that bother me via a temporary foray into someone else's life, someone who gets their HEA, and dystopians do the opposite for me. They make me feel unbalanced, paranoid and moody. I am afraid that if I read them, it will be so much harder to get up in the morning. 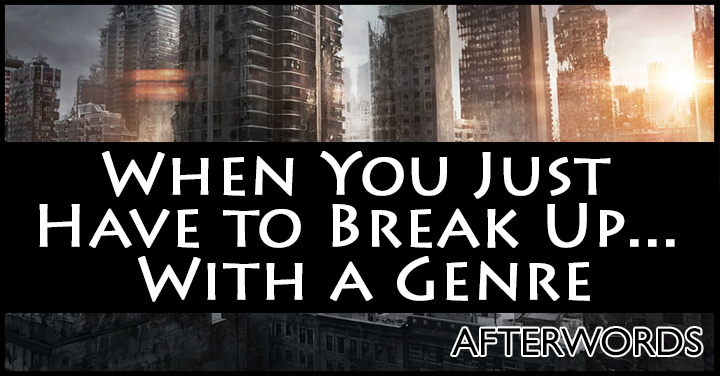 So my relationship with dystopians is tumultuous to say the least. I read maybe two dystopian novels in a year, but where three years ago I was angry at myself for this, I am now okay with this reality. I am never going to have an easy time with the depressing subjects, and that's okay. Everyone have things they find harder to handle. tbh, at this point I feel like dystopians are that ex you're still kind of friendly with and see twice a year at friends' birthdays. What about you? Are dystopians your favorite genre, or like me you kind of elegantly avoid them and pretend you don't see the row of unread dystopians on your shelves?